Welcome to the Crazy Crafters' Blog Hop with our Special Guest stamper, Cathy Caines - we are thrilled to have Cathy join us this month and so excited to CASE (Copy And Selectively Edit) any project that has been created by her. Cathy is a super-talented member of the Stampin' Up Artisan Design Team and her blog is filled with amazing cards, so it took me a while to settle on a card to CASE - but it was such a pleasurable process! If you click on the picture of Cathy's card above, you'll also be able to immerse yourself in the wonderful world of Cathy's projects! In my opinion, Cathy's card is just perfect, so I really didn't want to mess too much with the design. I used the Labeler Alphabet stamps to white heat emboss the word "are" onto Basic Black cardstock. Using the Multi Purpose Adhesive Sheets made adhering the Celebrate You die cuts very quick and easy to do. By the way - the Celebrate You dies are available FREE during Sale-A-Bration (until the end of March) with a qualifying purchase. All the details of the incredible Sale-A-Bration offers and opportunities are on my Specials & Promotions page. 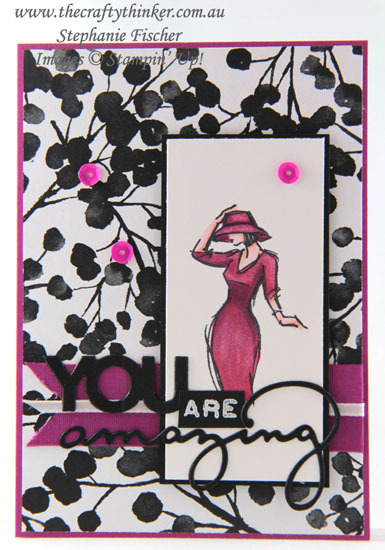 I coloured the Beautiful You lady with Stampin' Blends alcohol markers, so I stamped her with Memento Tuxedo Black ink. The base card is Berry Burst with a layer of Petal Passion Designer Series Paper. For the final decorations, I used two pieces of Berry Burst ribbon and one piece of Whisper White and a sprinkling of Tutti Frutti Self Adhesive Sequins.